Hiki was born and raised in Te Awaroa. She had a kind, caring and loving nature. She was energetic and loved to inspire and encourage those around her. Hiki worked as a wool handler for many years and loved her work travelling New Zealand and overseas. In 2010 Hiki returned home from the South Island and started a family. She has three beautiful daughters Sade (8), Aroha (6) and Renae (4). Hiki was a loving and nurturing mother, whose eyes would light up with joy whenever she saw her daughters. 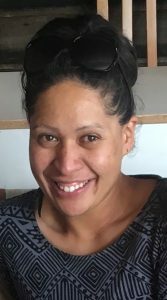 Hiki was employed at the blue berry farm in South Head where she enjoyed her work and her fellow work mates. Mihi and Hiki were both laid to rest at Oparuparuurupa overlooking Aotea and the Kaipara harbour, both close enough for their mokopuna and tamariki to visit. The Kawe Mate of Mihi and her daughter Hiki is where the whanau pani travel to Whitikaupeka Marae, Moawhango, Taihape on Saturday 17th November 2018, 3pm, to acknowledge and celebrate their lives with the whanau and iwi of Ngâti Tuwharetoa and Ngâti Kahungunu. Te Waru and his whanau would like to thank the local police, rescue helicopter, fire brigade, emergencies services and medical team who provided support to all those involved in the accident. Thank you to our whanau, hapu, iwi and community for the overwhelming love and support provided throughout the tangi. We acknowledge the Smith whanau at this time, who have also been affected by this tragic accident, and we send our love to Ted and wish him a speedy recovery.